Rangers: Charles Green SFA disrepute charge "not proven"
The Scottish FA disrepute charges against Rangers chief executive Charles Green have been found "not proven" by the judicial panel. A three-man body chaired by Lord Nimmo Smith is investigating allegations that Rangers' former owners used dual contracts to reward players. Green had questioned the independence of the Scottish Premier League-appointed team. However, he rejected claims that he queried the commission's integrity. The chief executive has qualified his comments, stressing he was not questioning the three-man commission but the potential outcome and the stripping of five of the club's league titles. 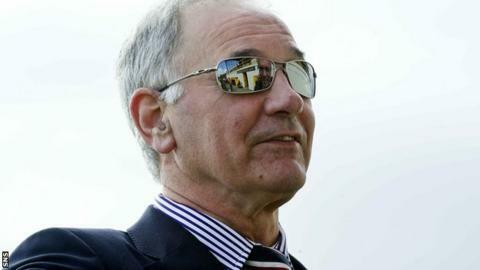 Green has suggested that the SPL has no jurisdiction to examine Rangers and look into any possible wrongdoing. The commission, comprising Lord Nimmo Smith and two QCs, found the charges against Green "not proven" on two counts - on rule 66, "bringing the game into disrepute by calling into question the integrity of the commission"; and on rule 71, "not acting in the best interests of football by calling into question the integrity of the commission". Lord Nimmo Smith last month issued a statement defending the hearing's independence from the SPL. It is alleged that Rangers failed to disclose secondary Employment Benefit Trust (EBT) payments made to players during the 2000-2011 period. In a statement, Green welcomed the fact the panel decided he had not brought the game into disrepute. "What I said, I said in good faith and I was speaking up for the interests of Rangers," he said. "To be critical of the SPL's handling of the EBT issue does not mean that I am showing disrespect for the game and that view appears to have been shared by the judicial panel. "It is my hope that we can all move on from today and start working constructively for the good of the game." Green called the EBT commission "yet another obstacle being placed in our path as we try to rebuild a great Scottish sporting institution". His statement goes on to praise fans, staff and players at Ibrox for their commitment to the club, and acknowledges the welcome afforded by Scottish Football League clubs to Rangers now that it is playing in the Third Division. Green added: "Perhaps it is now time that those people within the SPL who have been pursuing Rangers at every turn take stock. "As a member of the SFA, we want to work constructively within its structure and hope that all parties and organisations can take a view that what is of paramount importance is the good of the game. "To that end, we will be meeting with SFA president Campbell Ogilvie in the near future. "We want to be a force for good in football and it is surely to the benefit of all that the way forward is not frustrated by continually trying to look back." You can follow Alasdair Lamont on Twitter.